Matlask, or Matlaske, is a small parish in the northwest of the county. The landscape of the parish is dominated by the early 19th century landscape park around Barningham Hall, and the small village of Matlask sits just outside the park. Matlask comes from the Old English meaning ‘ash-tree where meetings are held’. The earliest archaeological finds from the parish are prehistoric flint implements (NHER 35659) including an Upper Palaeolithic handaxe (NHER 35659) and a Mesolithic flint axehead (NHER 6622). A probable Bronze Age ring ditch (NHER 36783) is visible as a cropmark on aerial photographs in the south of the parish. Iron Age pottery (NHER 35659) and a gold Iron Age coin (NHER 40479) have been found, as well as Roman pottery (NHER 35659, 36083), Roman coins (NHER 13054, 35659, 36550), a brooch (NHER 40481) and an important example of a Roman metal-smith’s claw hammer (NHER 36550). Middle and Late Saxon pottery (NHER 36083) and a Late Saxon strap-end with relief moulded decoration (NHER 37275) have been found by metal detectorists. In 1086 Matlask was held by the King and by Count Alan, and the Domesday Book records 15 freemen, 7 villagers, 2 smallholders and enough woodland to support 20 pigs. In the mid 18th century a 15th century psalter (NHER 44550) was discovered underneath a summerhouse that was being demolished in the grounds of Barningham Hall. The psalter is thought to have come from the shrine at Walsingham. In 1874 a 15th century gold reliquary (NHER 6697) was found in a field. 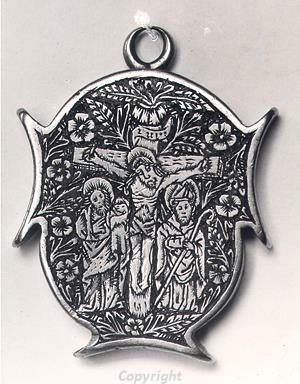 The reliquary shows the Crucifixion with the figures of a bishop and St John the Baptist. St Peter’s Church (NHER 6715) dates back to the Late Saxon period and has a round tower. The chancel collapsed in the 18th century and has never been rebuilt. The site of the medieval hall (NHER 12172) of the Winter family was demolished in 1612 when Barningham Hall was built. Brick and flint foundations have been recorded on the site, and are visible as cropmarks on aerial photographs. Matlask is now much smaller than the medieval village, and the earthworks of the medieval village (NHER 29590) are visible in the fields near the Rectory. A hollow way may be the remains of the village street, and there are also a series of ditched enclosures. Barningham Hall (NHER 6569) is a large mansion that was built in 1612 for Sir Edward Paston. The west façade has a three-storey porch tower and unusual two-storey dormer windows. The house was remodelled between 1805 and 1807 by Humphry Repton and his son, John Adey Repton. Some original 17th century plasterwork and panelling survives inside the hall, and many of the other interior features date from the early 19th century. The Hall is surrounded by a landscape park (NHER 30431) designed in the early 19th century by Repton. The park has an ornamental lake, belts of trees and an avenue. The formal gardens were close to the house, and Repton designed a raised terrace to the south of the house; the earliest 19th century example of this type of terrace in Norfolk. Some of Repton's original illustrations survive, although his Red Book has probably been lost. An earthwork causeway (NHER 29598) was surveyed in 1993 in the west of the park. The causeway is the remains of a post medieval road shown on Faden’s map of 1797. St Mary’s Church (NHER 6576) stands within the park. The medieval tower, nave and the south porch are all in ruins. The chancel is still in use, and has a 19th century extension that projects westwards into the nave. South Lodge (NHER 44548) was designed in the early 19th century by the Reptons, and is built of red brick with a thatched porch. Cromer Lodge (NHER 44526) is a mid 19th century red brick and thatched lodge. The coach house and stables (NHER 44547) date to the 17th century with 19th century alterations. Repton also designed the early 19th century walled kitchen gardens (NHER 44548), which have arched entrance gates. 24 to 26 The Street (NHER 13666) is a 16th century brick house now divided into three dwellings. 18 and 19 The Street (NHER 16137) are a pair of 17th and 18th century cottages with a 19th century wing. Wells Farmhouse (NHER 12326) is a 17th century brick farmhouse with later alterations. The east gable wall dates to the 17th century and has large blocked pedimented windows. Dairy Farmhouse (NHER 22733) is a 17th century flint and brick house with a polygonal dairy to the rear. Hall Farm (NHER 22735) is a 17th century lobby-entrance house, and a 17th century brick and flint barn stands nearby. Barningham Old Rectory (NHER 44527) is a former rectory dating to about 1830. The house has an attached stable block and coach house. Garibaldi Cottage (NHER 22734) is the most unusual building in the parish! It was built in 1860 and has a half-timbered bay bearing the inscription 'BUILT IN YE YEAR THAT GARIBALDI ROSE TO FREE ITALIA FROM HER FOREIGN FOES'. The cottage also has a carved wooden statue of Garibaldi as a corner post. The Woodland Rapid Identification Survey was carried out in 2006, and identified a post medieval brick kiln (NHER 12169), boundary banks (NHER 44009, 44010, 44013) and extraction pits (NHER 44011, 44014, 44015). Matlask Airfield (NHER 6689) was used by the RAF during World War Two, and was a satellite airfield for RAF Coltishall. Several air raid shelters and the base headquarters still stand on the site of the airfield. An octagonal World War Two pillbox (NHER 13667) stands on Wickmere Road in the village. A rare type-22V pillbox (NHER 18634) stands at a crossroads near Matlaske Gap. Sarah Spooner (NLA), 11 May 2006.